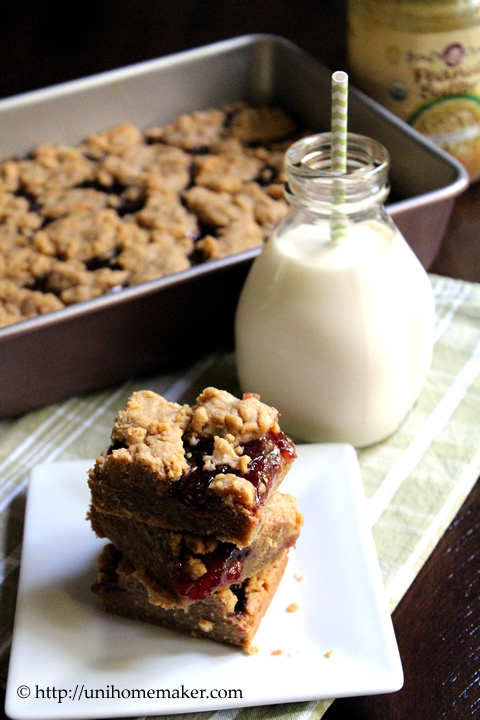 I made some PB&J bars yesterday. I was hoping to give some away to my friend Lisa and my neighbors, and send the rest off with Chris to share with his co-workers. I sent an email out to my neighbors first to see if anyone may want them before I distribute them, as not everyone likes the combination or peanut butter for that matter. I was pleasantly surprised to find so many takers! Not sure if it was the free baked goods or that they really liked PB&J. In the end, I was only able to send four pieces off with Chris *sad face* :(. These are rich, dense (thanks to all that butter and sugar) and wickedly good! So if you’re not watching that waistline this summer, go bake yourself a batch of these. You’ll be glad you did. Have a great weekend!